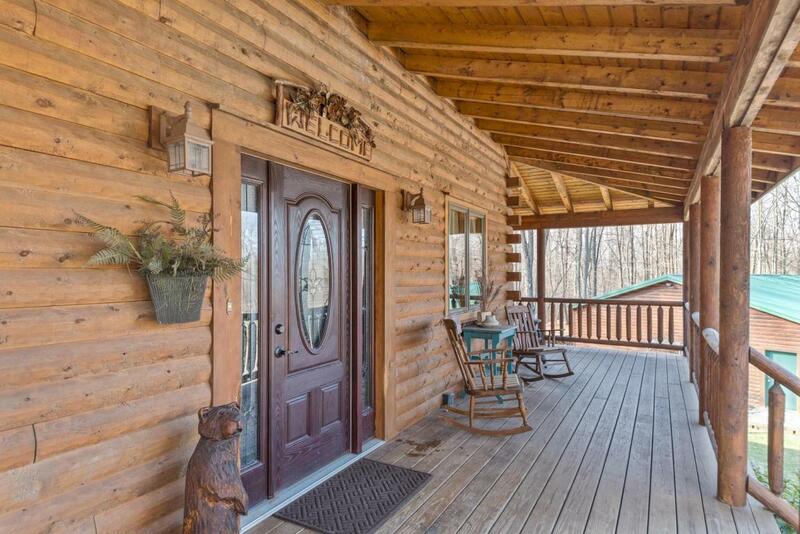 Gorgeous Cedar Log Home sits on almost 12 wooded acres w/mature trees & 2-Springs!! Post and Beams are structured with White Pine Rafters! Fabulous home features Large Great Room with Cathedral Ceilings, Kitchen Island Bar & Eat-in Area, Suites on every floor!! First-floor Master Bedroom, Large Guest Loft with Full Bath & Lower Level with Bedroom & Full Bath! The Lower Level features a WB Stove, Tiled flooring & walks out to side patio pavers! Geo Thermal Heating & Cooling! Detached 3-Car Garage with Workshop & extra storage, Lean-to Outbuilding & Chicken Coop! There are 2 natural springs on the property! Outside Vegetable Garden with strawberries, raspberries & asparagus! This is a Spectacular private Retreat that has quick access to shopping & downtown!